Finnish Lapland is known for its clear skies and a very high hit rate when it comes to the Northern Lights, with viewings occurring on average on two out of every three nights every winter. Moreover, this winter is predicted by NASA to have the brightest Northern Lights in 50 years due to the clashing of two solar cycles producing increased solar activity, so it is an ideal time to visit. The brand new app, Laplication with its detailed guide of the different areas of Finnish Lapland is perfect for preparing for a trip. It also allows Northern Lights hopefuls to experience the incredible natural phenomena from the palm of their hand using augmented reality. 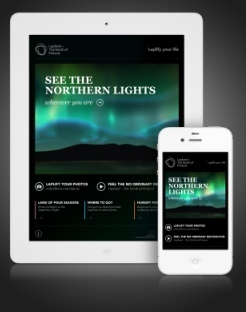 Users can simply turn the phone upwards and the screen will change to the Northern Lights. When the phone is put in the upright position again, the image returns to normal. The app can be downloaded for free from iTunes. 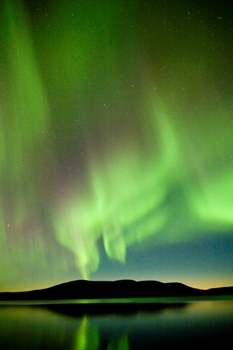 Hotel Kakslauttanen is committed to offering the best views of the Northern Lights in the most comfort. Sit in one of the glass igloos, made of a special thermo glass which keeps the interior at room temperature while not frosting the windows. Prices for a three night stay in one of the hotel’s log cabins from November to April, start from £945 based on two sharing. For a more ‘hands on’ adventure, the Midnight Snowmobiling Aurora Safari Experience takes visitors out across the ice fields to specially chosen look-out points, far away from artificial light. Spend the evening on the hunt for the lights and then relax around a campfire sipping a hot drink. The Aurora Safari lasts 2 hours and costs £55 per person (based on two sharing a snowmobile). Pick up is from the northern central town ofKemi. What better way to see the beauty of the Northern Lights than from the comfort of your very own hot tub? RukaVillage is a high class hotel, in the heart of Ruka ski resort, with large apartments offering outdoor hot tubs from which visitors can admire the night sky phenomenon, with minimal effort! Located just below the Artic Circle, Ruka is surrounded by frozen lakes and snow-sculpted forests, ensuring snow-sure skiing all season long (late November – early May). Winter prices for 7 nights at RukaVillage start from £708 per apartment, including double bed, fold-out sofa bed, kitchen, balcony and sauna.